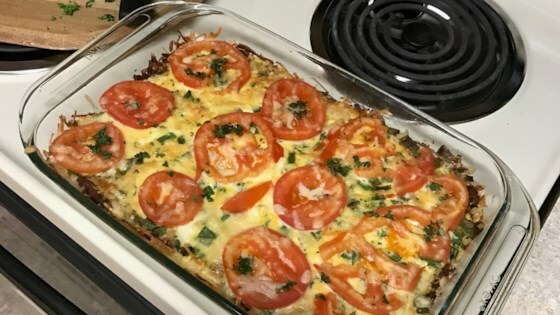 "This is a wonderful breakfast casserole that will feed many. We have it every year for Christmas brunch. The family will not allow me to make anything else. I pair it with my French Toast Strata and everyone is full and happy. It's also very easy to increase the portion by putting it into a 9x13 dish and just adding extra ingredients." Toss the potatoes with the vegetable oil in a bowl until potatoes are well coated. Press the potatoes into a 10-inch pie pan to create a crust. Bake potatoes in the preheated oven until golden brown, about 30 minutes. Remove pan from oven, and reduce heat to 350 degrees F (175 degrees C). While the potatoes are baking, heat a large skillet over medium-high heat and stir in the sausage. Cook and stir until the sausage is crumbly, evenly browned, and no longer pink. Drain and discard any excess grease. Combine the sausage with the eggs, mushrooms, pepperjack cheese, Swiss cheese, milk, 1 tablespoon parsley, garlic salt, and black pepper in a large bowl. Pour the egg mixture into the prepared potato crust. Bake in the oven until eggs are set, about 25 minutes. Arrange the tomato slices over the eggs and sprinkle the remaining 1 1/2 teaspoon parsley on top. Return to the oven and continue baking until the tomatoes soften, about 5 minutes more. Made this for Thanksgiving brunch, I thought it was very good but everyone else liked another breakfast casserole that I made off here. I made this for company and everyone loved it. The only change I made was, I used turkey sausage instead of pork sausage. I would definitely make this again! I also used turkey sausage, added a little onion,and used Pam instead of oil. Everyone loved it! Great fast dinner. I cut back some on sausage and next time will add some of the salt to potatoes. My kids ate it with ketchup and loved it. Very good, I used hash brown potatoes with onion and peppers, also a smoked Swiss cheese, light sausage (used half a lb). It was a hit and easy to put together.